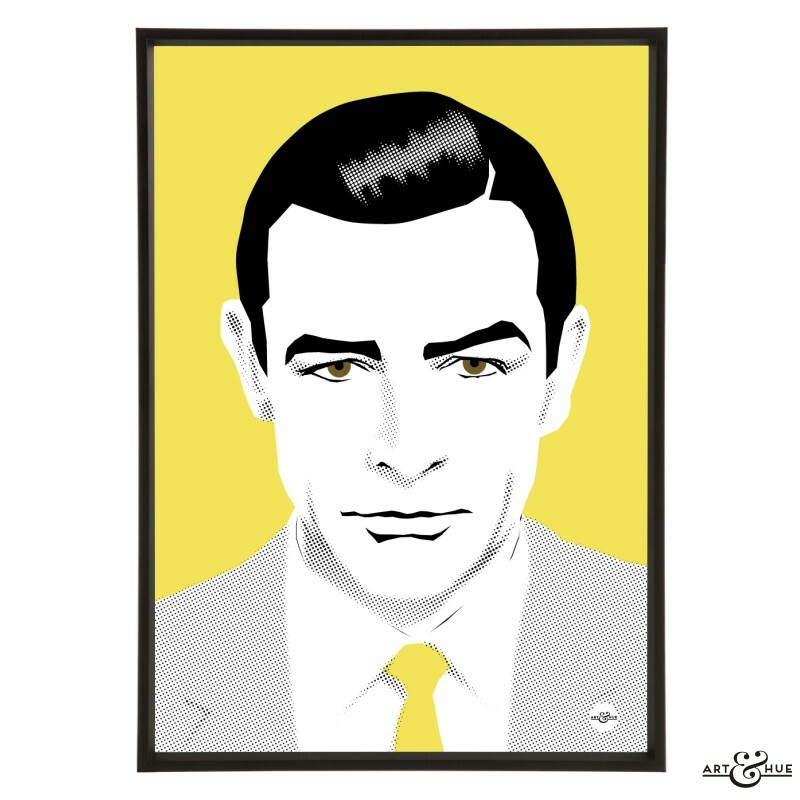 James Bond has become a British institution recognised around the world and the long-running spy film series all started 55 years ago. 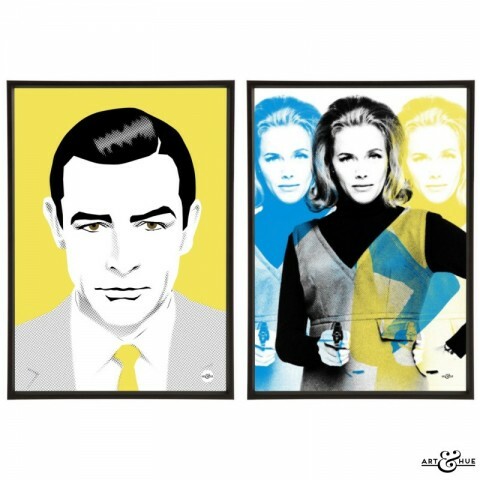 2017 marks 55 years since the first ever Bond film when Dr. No started filming on the 16th of January 1962 and premiered in October of the same year. 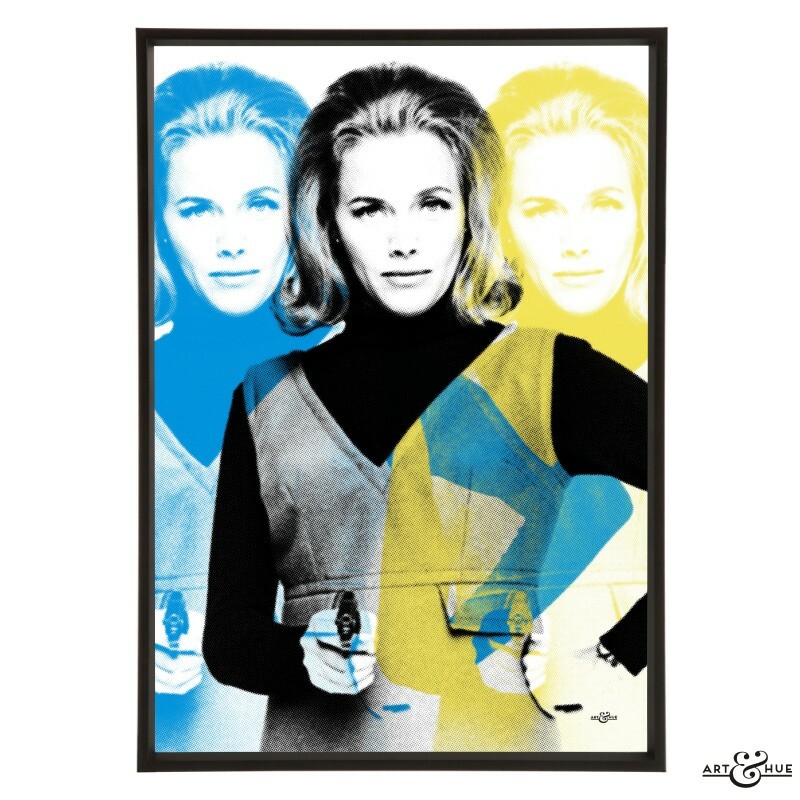 Gadgets, glamour, and guns – they’ve become familiar to global audiences and no spy film or TV show can use them without being aware of the legacy of the suave British agent 007. 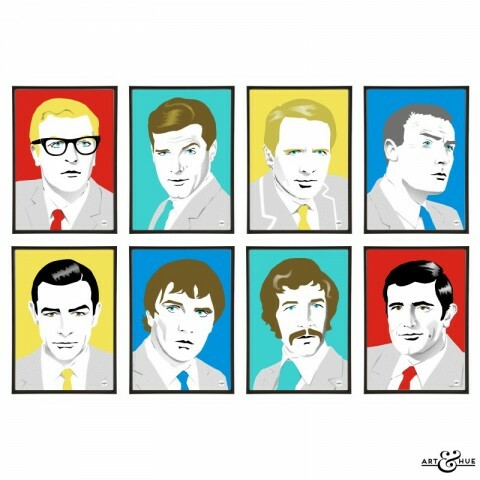 The year before the first ever Bond film “Dr. 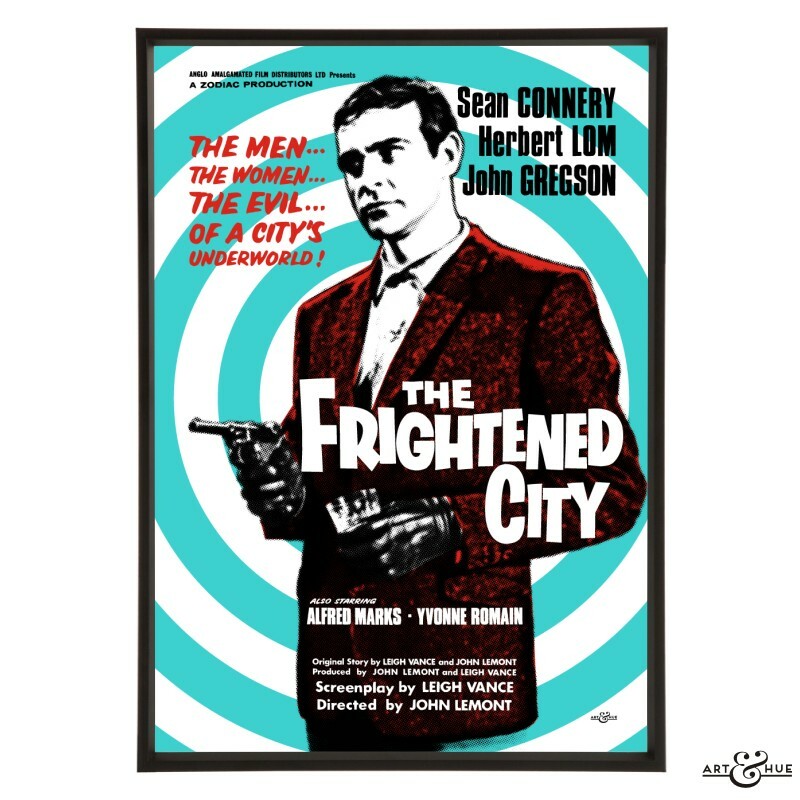 No” started production, Sean Connery cut a dash as a London gangster in the British noir film “The Frightened City”. 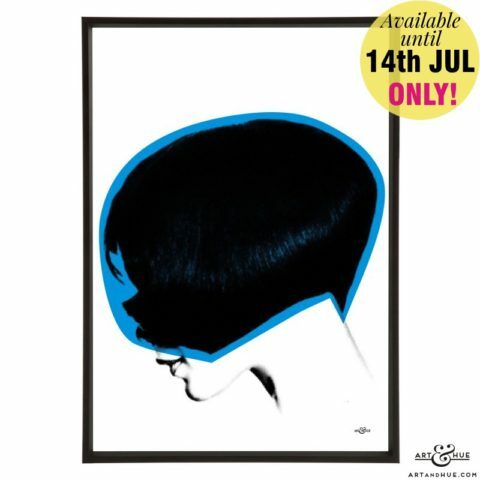 Seduction, guns, judo, and drinks – with hindsight it makes perfect sense that Cubby Broccoli would want to cast the vital Scotsman as 007 after seeing Connery steal this tale of London crime gangs and protection rackets. 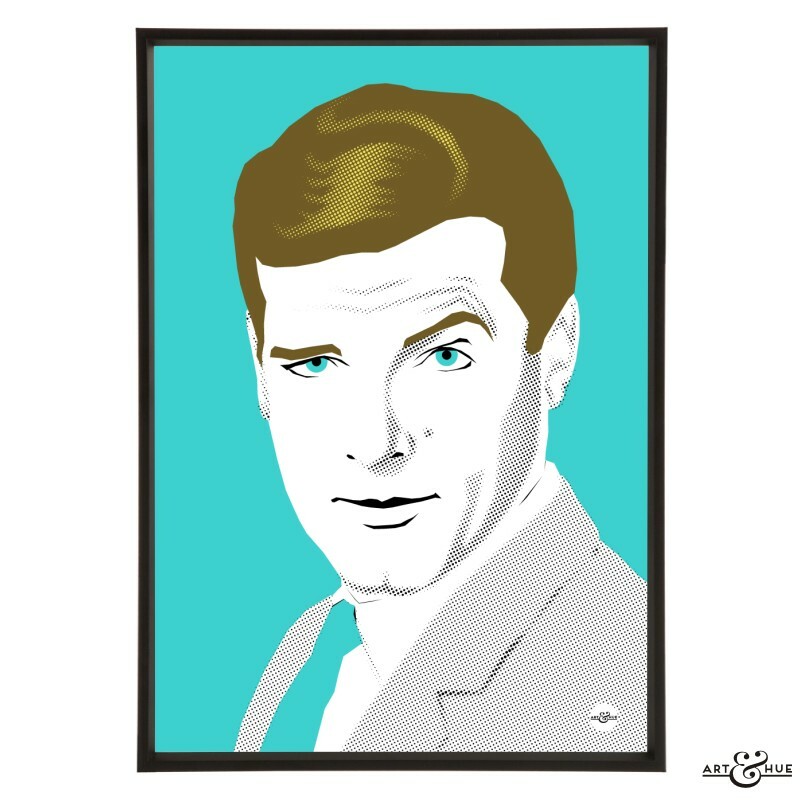 Before taking on James Bond in the 1970s, Roger Moore was well known to audiences as the suave Simon Templar in “The Saint” which ran throughout the 1960s. 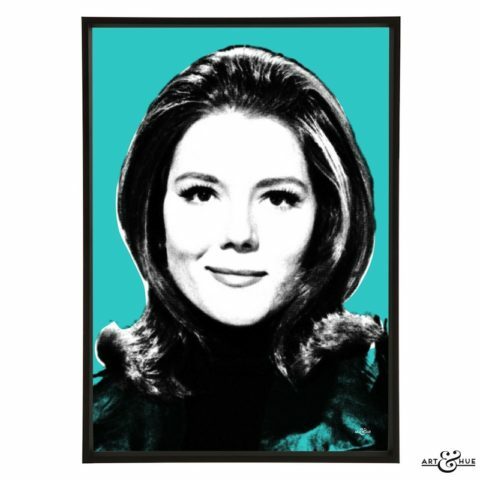 From 1962 until 1969, “The Saint” is one of the most productive 1960s British television series, second only to “The Avengers” in the amount of episodes. 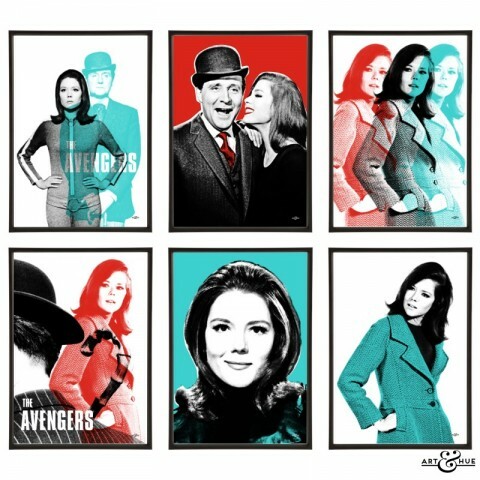 Both shows were made at Elstree Studios and Roger Moore would frequently visit the set of “The Avengers” to have a cup of tea with his good friend Patrick Macnee or surprise Linda Thorson. 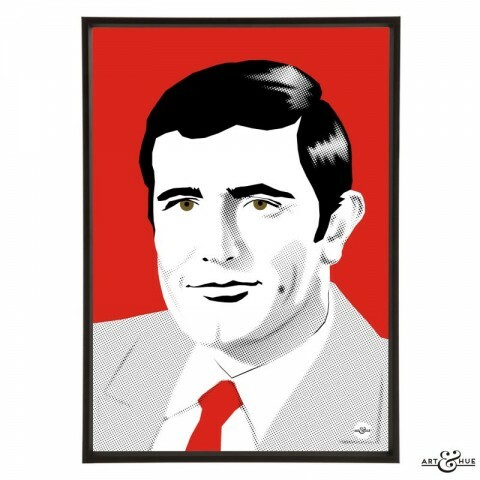 Debonair and charming, it’s no surprise that Roger Moore was approached to take on the role of 007 when Connery had decided to move on, but it wouldn’t be until after George Lazenby had a go and Sean Connery had reprised the role that Moore would step into the part of James Bond in 1973. Despite only making one film appearance as James Bond, George Lazenby‘s 1969 outing is a memorable one. 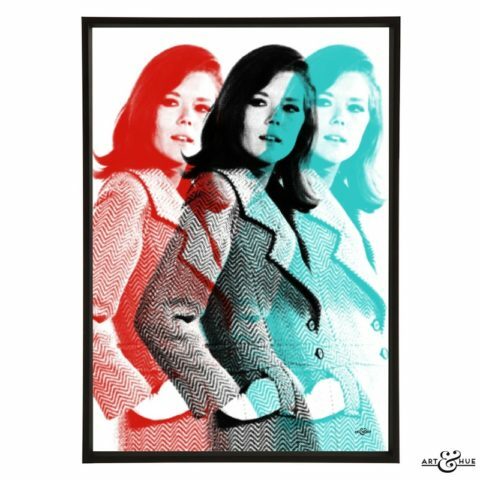 Regarded by many to be the best Bond film, “On Her Majesty’s Secret Service” has it all – Diana Rigg, Joanna Lumley, Anouska Hempel, Verner Panton lighting, a mountain-top lair, a Christmas song, a beautifully poignant love song by Louis Armstrong, and arguably the best John Barry soundtrack ever. 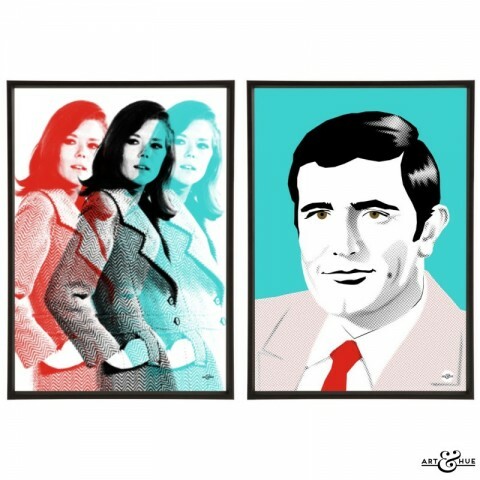 Appearing in the final James Bond film of the 1960s, Lazenby got a mixed response at the time (one critic of Lazenby’s wrote that they should have have shot James and let Diana Rigg live to continue as Bond, Tracy Bond) but the film has stood the test of time and endures as a classic. 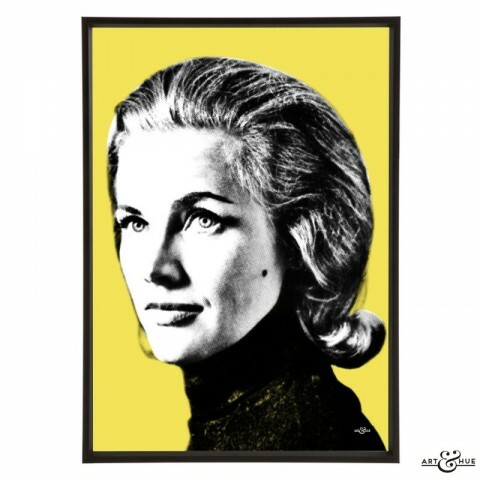 The term “Bond Girl” seems to apply to all actresses that have appeared in the spy films, whatever their age or attributes – many were strong, independent, and inspirational women who were Bond’s match. 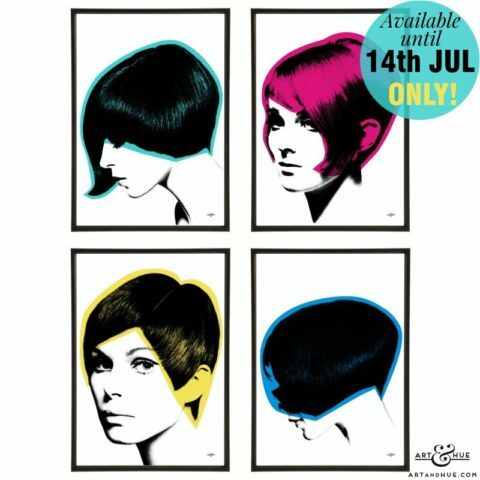 Art & Hue has stylish pop art of iconic actresses who have appeared in some of the Bond films. 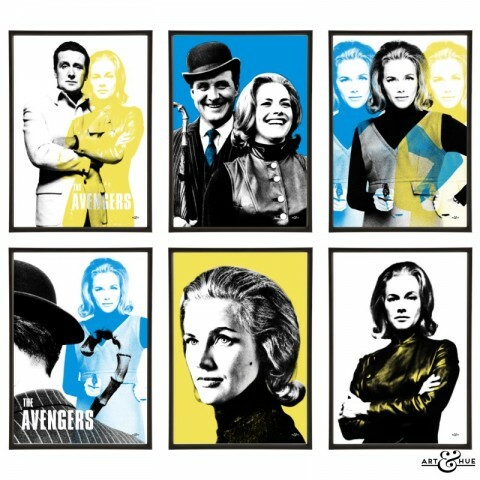 From the tough Honor Blackman in “Goldfinger”, to the only woman to take Bond up the aisle, Diana Rigg in “On Her Majesty’s Secret Service”, both graduated from the classic 1960s series The Avengers to James Bond, whereas Joanna Lumley moved in the other direction – from “OHMSS” to The New Avengers. Britt Ekland appeared alongside Roger Moore in his second outing as James Bond, “The Man with the Golden Gun” in 1974. 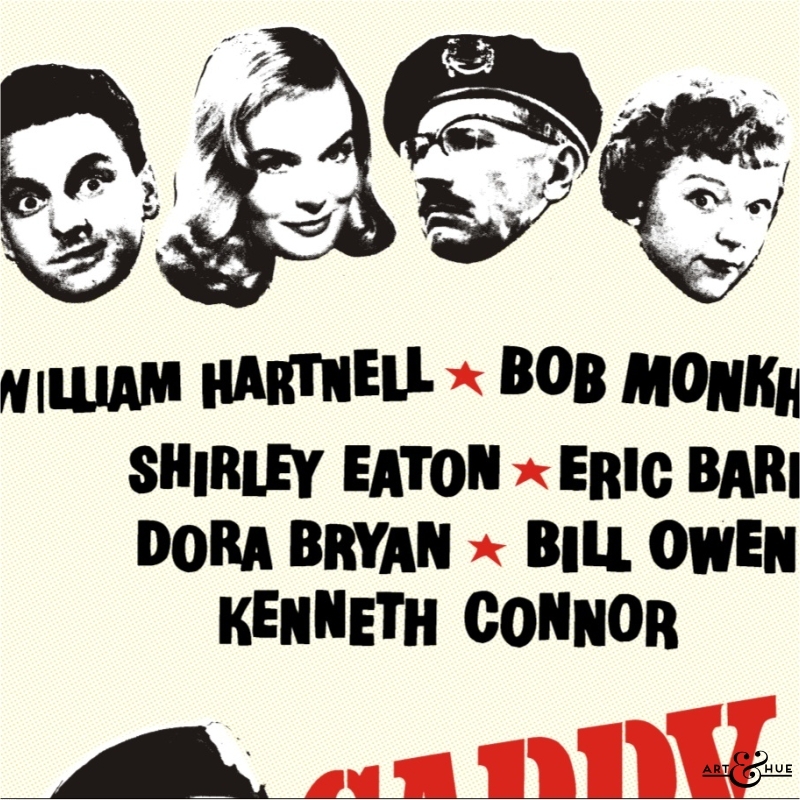 Also starring British cinema icon Christopher Lee as the villain, the film had a powerful song performed by Lulu featuring memorable lyrics. 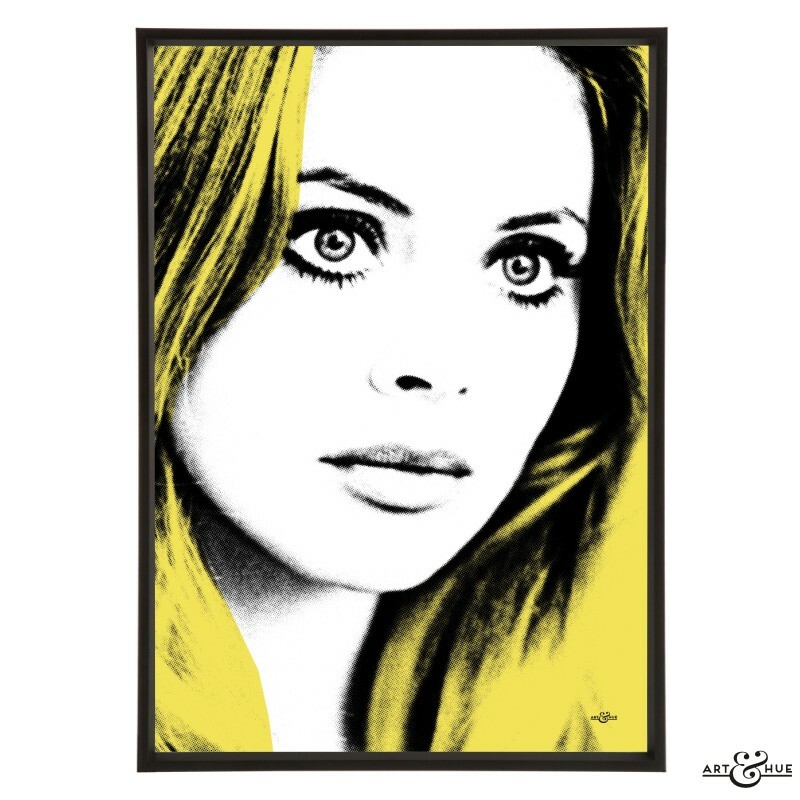 Britt Ekland has appeared in many iconic productions including “The Wicker Man“, also starring Christopher Lee, which is frequently described as the best British horror film, as well as a classic scene in Absolutely Fabulous with Joanna Lumley set in Joe’s Café, also featuring Lulu. Valerie Leon appeared in two Bond films, in a supporting role as a receptionist in “The Spy Who Loved Me” with Roger Moore, and got frisky with Sean Connery in “Never Say Never Again”, when he reprised the role of 007 in 1983. 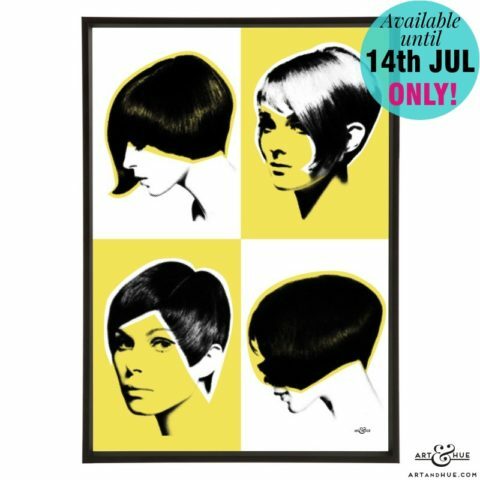 Actress and model Jeanne Roland also appeared in two Bond films, the unofficial “Casino Royale” and the official “You Only Live Twice”, both in 1967, after she had modelled Vidal Sassoon’s modernist hairstyle as featured in this pop art print. There are also pop art prints which feature Anouska Hempel (who appeared in “On Her Majesty’s Secret Service”) as a vampire in “Scars Of Dracula”, part of the Hammer Horror pop art collection; and, celebrating her 80th birthday today is Shirley Eaton, who was painted gold in “Goldfinger”, on the pop art version of the poster for Carry On Sergeant, the first Carry On film of the most prolific British film series (yes, more films than Bond) in which she appeared as Bob Monkhouse’s wife.